The staff in a automotive dealership's car rental department must be sure to use the proper car rental agreement forms as well as many other business forms related to the car rental agreement department; plus keep all this important paperwork organized. They deal with the service department, the body shop, insurance companies and car rental companies on a daily basis. A car rental agreement form contains many important provisions. Among many other provisions, a car rental agreement identifies the parties, the vehicle, the time frame for the rental, and the cost of rent for the time. A car rental agreement must also be clear about how the lessee can use the car, and the condition in which the car should be returned to your automotive dealership. A car rental agreement may also include an option to purchase auto insurance, fees for late returns, fees for failure to top off the gas tank before returning it, notice that the lessee is responsible for any parking or traffic violations, and notices on how to handle thefts, accidents, break-downs and towing among many other possible provisions particular to your state, region or automotive dealership. If your automotive dealership uses custom car rental agreements, call Estampe Automotive Dealer Supply at 1-866-348-6414 to get a custom quote. Our custom printed car rental agreements automotive forms are guaranteed to be compatible with all automotive dealer management systems or auto dealer rental software. 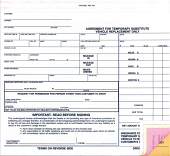 These Car Rental Agreement forms are very good all around forms and come in two styles. Of course, it's extremely important to clearly spell-out your rental terms and details. Plus, these forms allow all charges to be itemized for each and every item charged during rental. File holes for easy posting. This Rental Car or Loaner Car Agreement is designed for the temporary rental or loan of a substitute replacement vehicle to service customers or body shop customers. This rental car agreement may be used for both charged rentals or no-charge loaner vehicles.